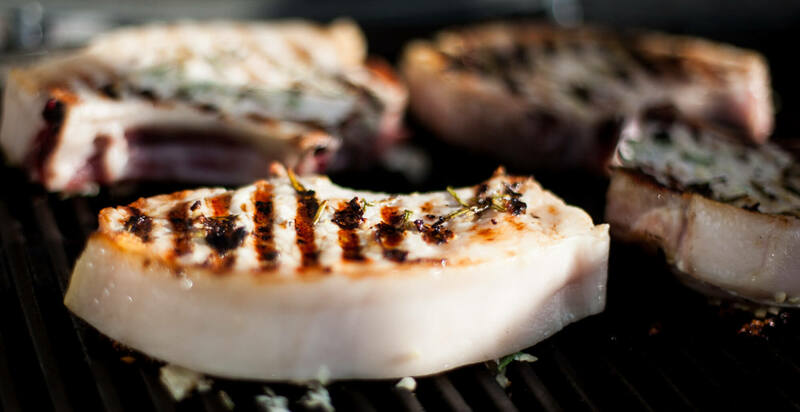 Something that always puts me in a summer mood is when it is warm enough to barbecue, and one of the things that is great for barbecuing is pork. I created this dish for the 3rd round of madbloggerudfordringens. 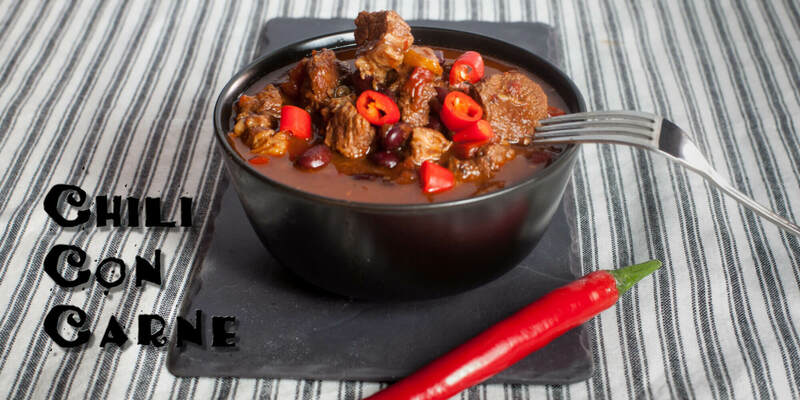 The savory part of the challenge had to contain three ingredients. 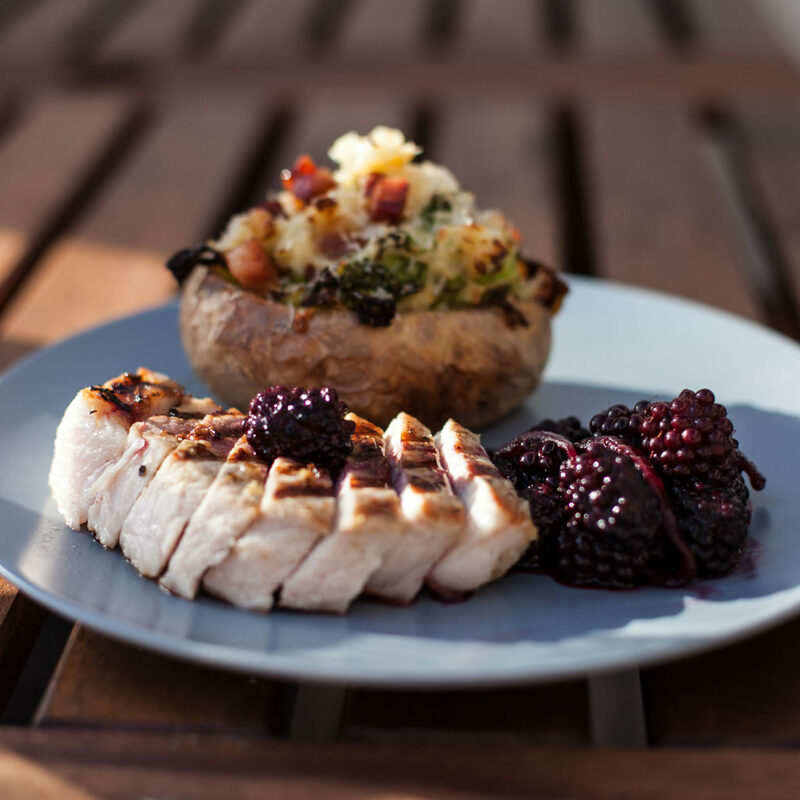 Pork, berries and leafy green vegetables. As spice for my chops I have used some classic spices as juniper berries, garlic and fresh rosemary. 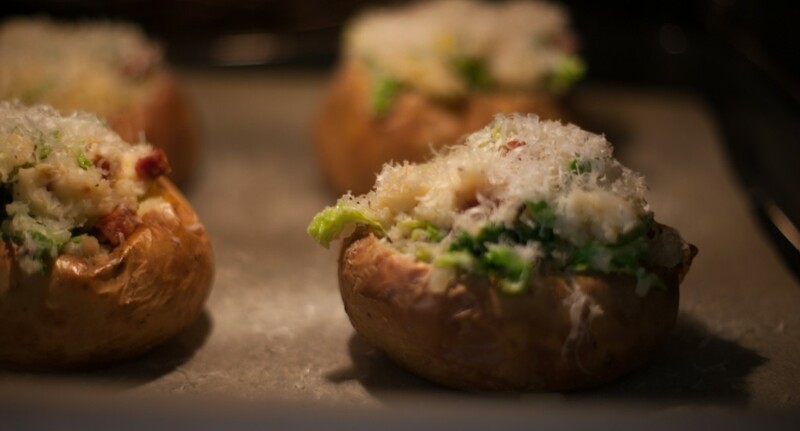 As a side I have made a twice baked potato, where the contents have been taken out and mixed with savoy cabbage and crisp pancetta and put back in the oven. 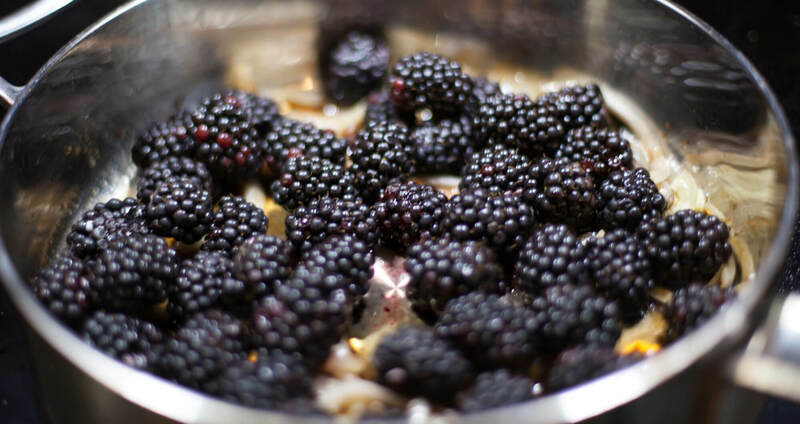 The other side is black berries sauteed in balsamic vinegar og honey. 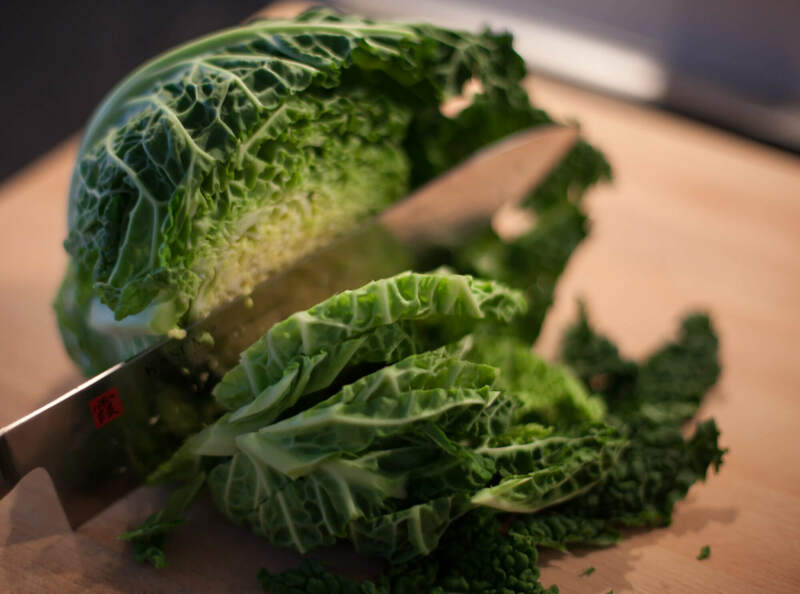 Cut the cabbage in longish pieces. Sauté the cabbage in olive oil. 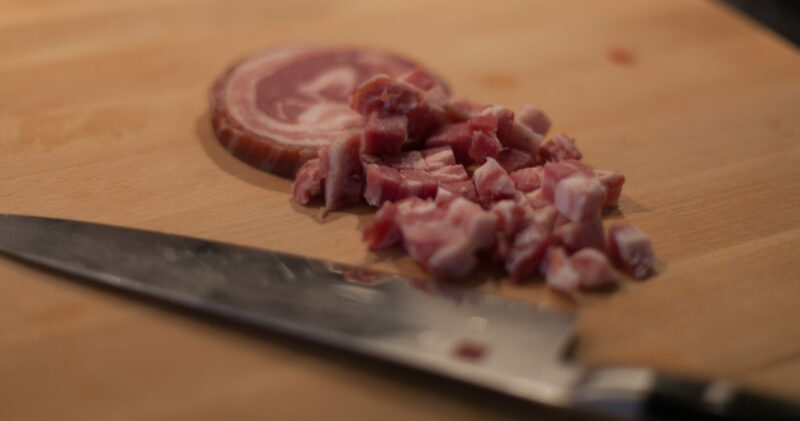 Cut the pancetta in dices. 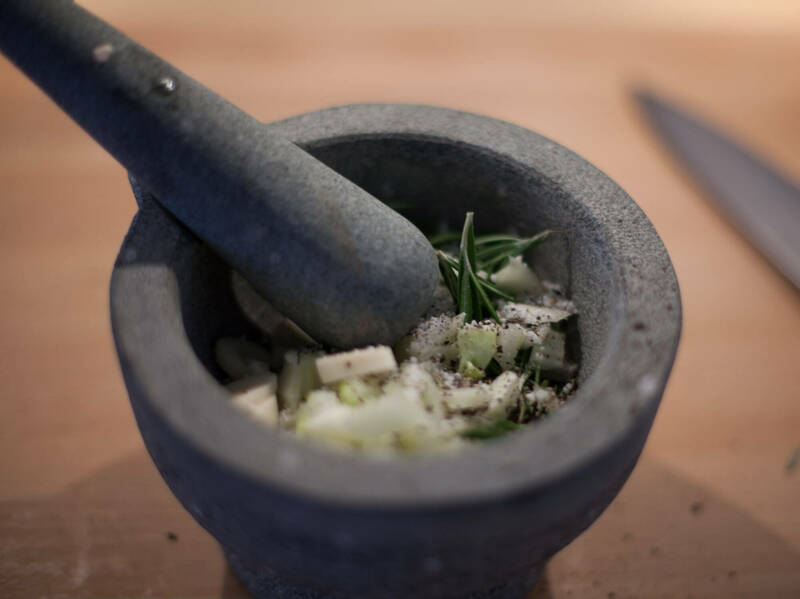 Cut fennel and garlic in small pieces. 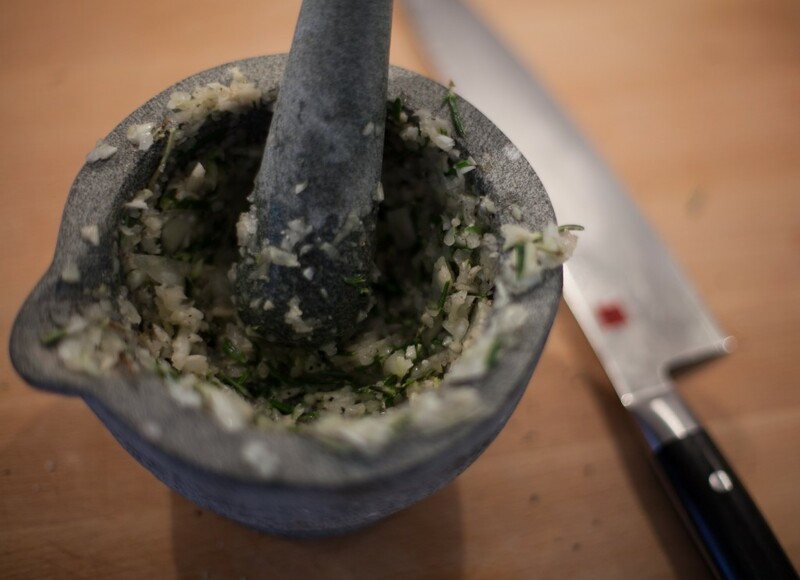 Put them, salt, pepper, juniper berries and the leaves of three sprigs rosemary in the mortar. Crush it to a paste. Spread the paste on both sides of the pork chops. Light/turn on your barbecue so that is it ready for when the potatoes have been in one hour. 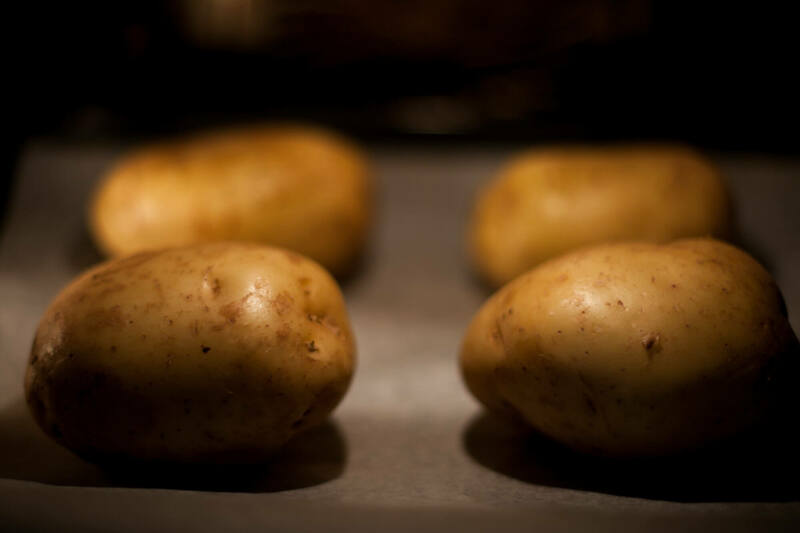 When the potatoes are done, cut off the top and scrap out the flesh. Leave a layer of about ½ cm so that the skin does not collapse. 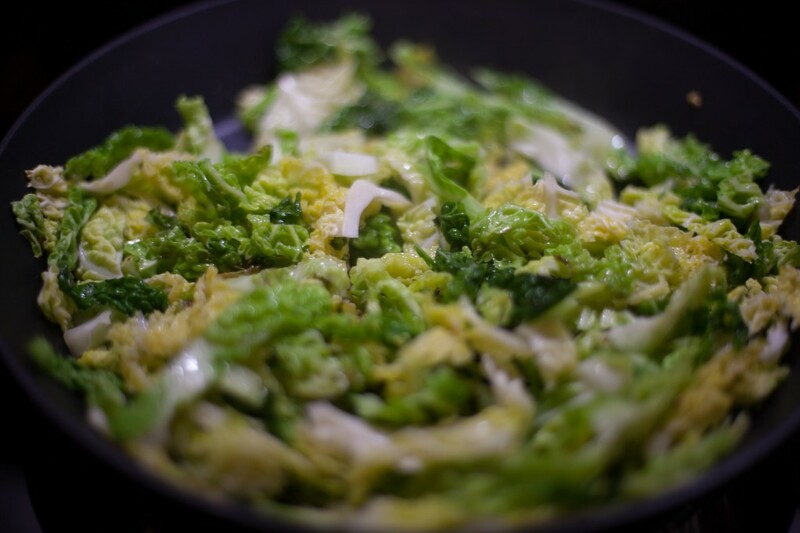 Mix the mash with butter, salt, freshly ground pepper, cabbage and pancetta. 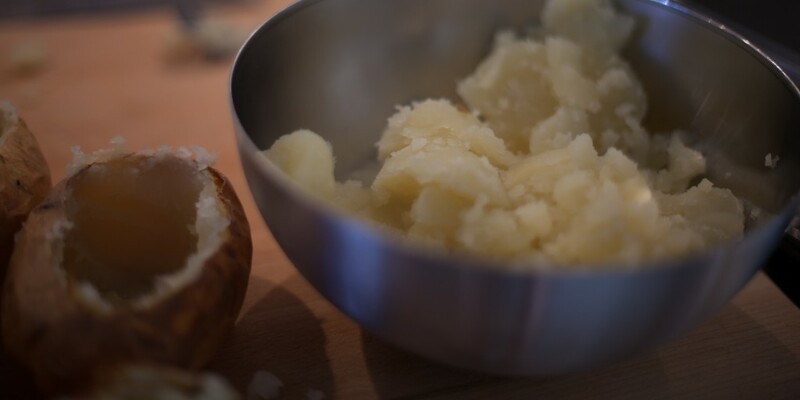 Put the mash back in the potato peals and grate some parmesan on top and put back in the oven for 15 to 20 minutes. 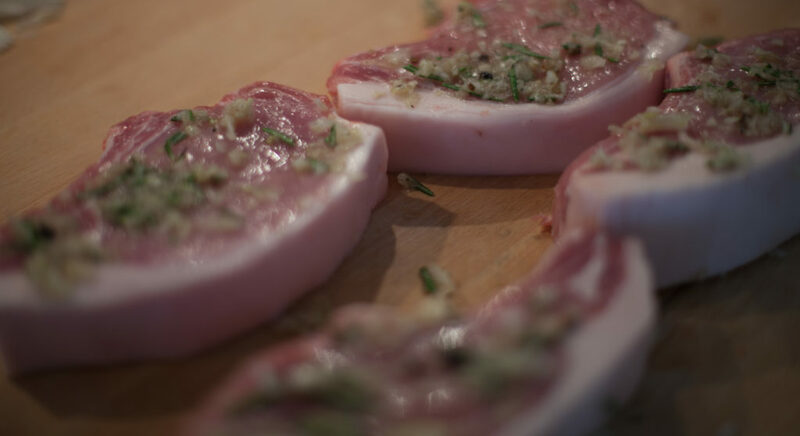 Put the pork chops on the barbecue. 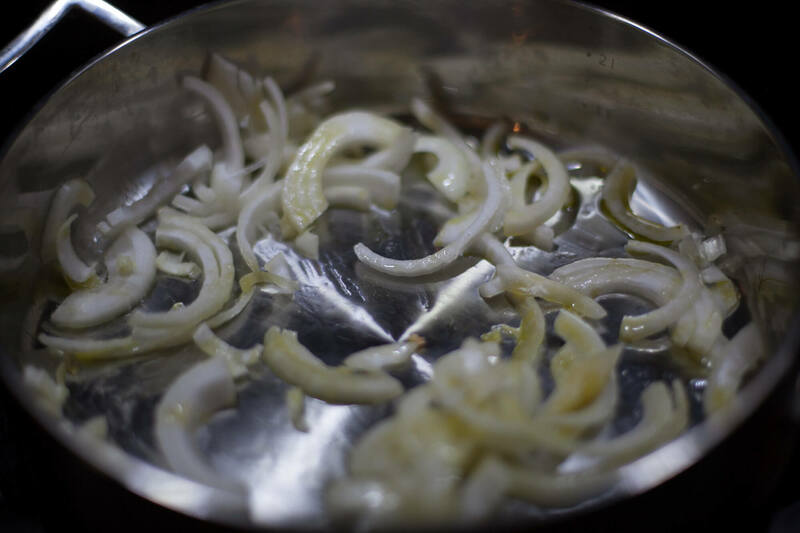 Fry an onion in a pan. 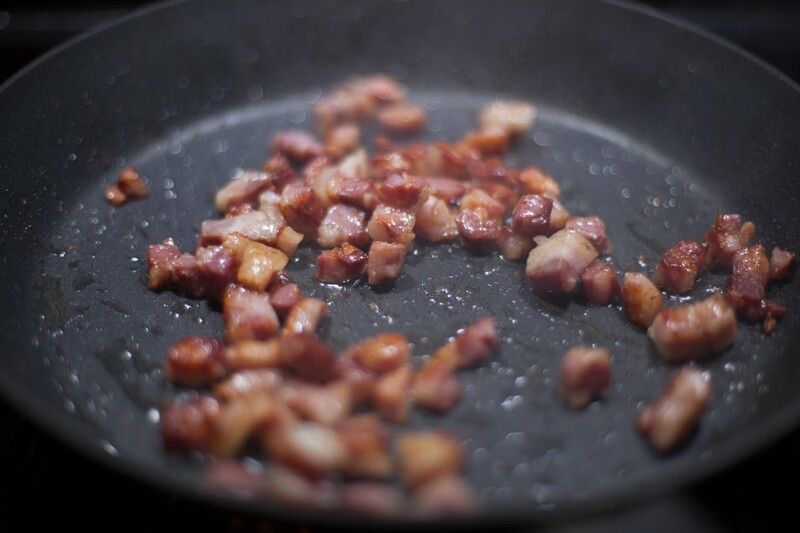 Turn the heat down low and add one tbsp of balsamic vinegar og 4 tbsp of honey. Put the berries on top and let simmer with a lid on. Finish frying the chops and let them rest. Serve while everything is hot. 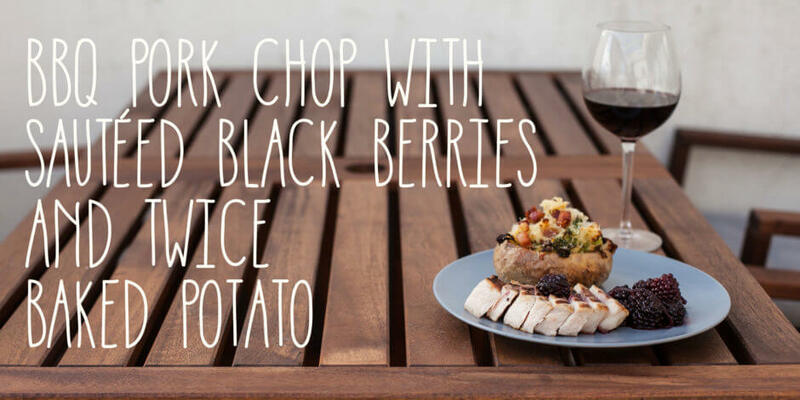 That is how you make a bbq pork chop with sauteed black berries and twice baked potato. Enjoy.